Right Vision…Right Time — Are You Ready for Change? Change is all around us. We experience it personally. We experience it interpersonally with those closest to us. And, we experience it at macro levels organizationally, societally, and globally. Some changes happen to us—changes that we do not have much say over. But many other changes are ones we do have a say over…when they will be initiated…when they will be implemented…how they will be implemented. One of the overarching themes in Peter Drucker’s writing was the importance of balancing continuity and change in organizational practice. Organizations need time-tested practices in the form of organizational continuity, and organizations need innovation in the form of organizational change. A core job of leaders is to know when to hit the accelerator to advance change and when to hit the break to reinforce organizational continuity. In discerning when to stop and when to go, the following model may be useful in discerning whether you and your organization are ready for change. The model is structured around two core questions: Is it the right vision? Is it the right time? Is it the right vision — …for you as the leader? …for the members of the organization? …for those you serve as an organization? Is it the right time — …are you ready for this change as a leader? …are the organizational members ready? …are those your organization serves ready? Answers to these two driving questions point leaders to four traffic signals that may be used to guide their decision about whether or not it is the right season of change for you and your community. 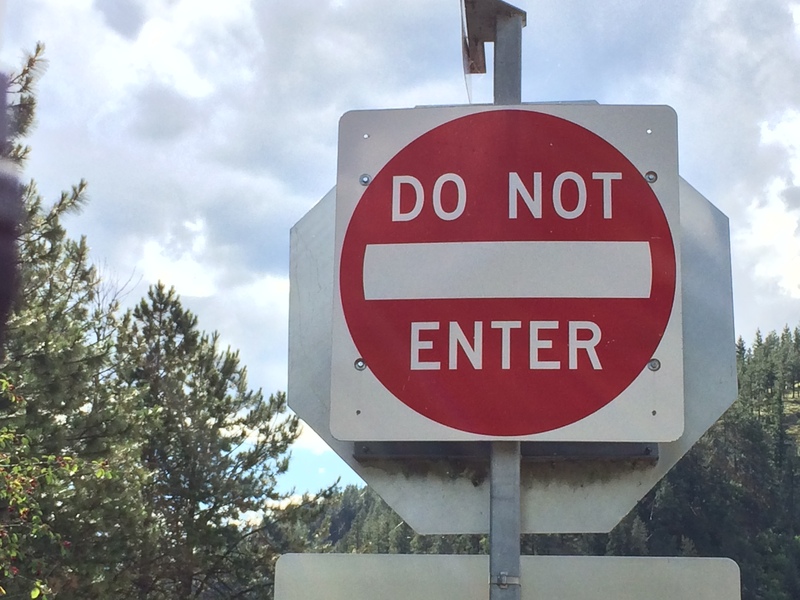 Traffic signal #1 is “Do Not Enter!” When it is both the wrong vision and the wrong time, as leaders we need to hit the break on change and stop. Pressing for change when it is the wrong vision and the wrong time will lead to FAILED CHANGE. Traffic signal #2 is “U-Turn Required!” When it is the wrong vision but the right time, leaders need to find a safe place to pull over and turn around. Pressing for change when it is the wrong vision but right time will lead to MISGUIDED CHANGE. Leaders who recognize this unique situation of organizational readiness and misfit vision will have the courage to make a U-turn and get the organization headed in a new direction with a new vision. Traffic signal #3 is “Yield!” When it is the right vision but the wrong time, it is time for leaders to see and respond to the yield sign. It is recognizing that while the vision is right, the organization and its people may not be ready. This is often the hardest signal for leaders to follow, because waiting for the right time is difficult. However, pressing for change when it is the right vision but wrong time will lead to a FORCED CHANGE. Forced changes often result in failed change. Leaders in this situation must exercise patience and put people before goals. Finally, traffic signal #4 is “Go…Green Light!” When it is both the right vision and the right time, as leaders it is time to hit the accelerator and navigate through a planned path of change. When it is the right vision and the right time, this is a moment of OPTIMAL CHANGE READINESS. So, are you ready for change? Following this change readiness model based on vision and timing will go a long way in guiding leaders toward the proper season for enacting change. I found this post very helpful and insightful. The world is changing as such a rapid pace and we are all experiencing some form of imminent change. 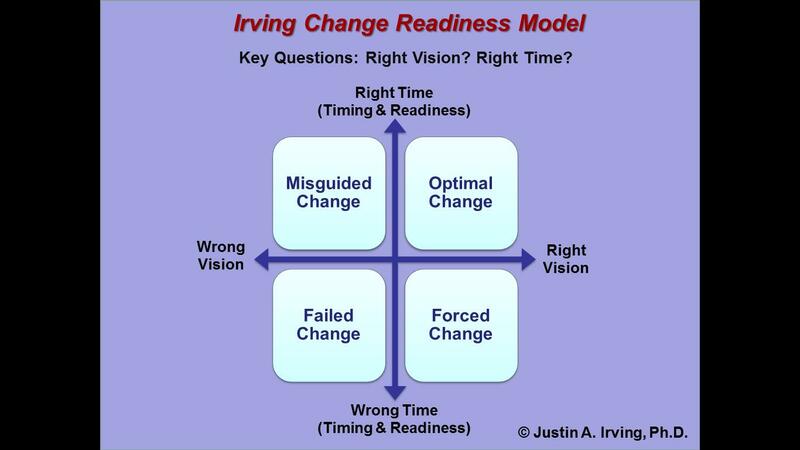 The Irving Change Readiness Model offers a nice approach to dealing with changes specially for those currently at that intersection. Thank you For sharing with us Justin.